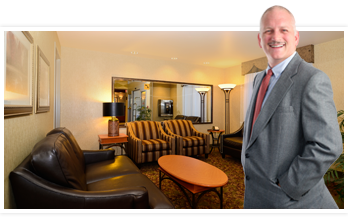 Our Calgary hotel accommodations are clean, modern and uncommonly spacious, offering luxurious lodging at reasonable prices. In every one of our large, attractive guestrooms, you’ll find top-drawer amenities like a 42” high-definition TV, MP3 clock radio, pillow-top mattress and mini fridge. 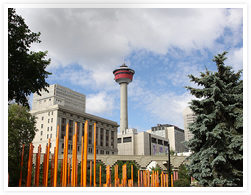 Save money and treat yourself to a great night’s rest: book your downtown Calgary hotel room with us today. This spacious room features two queen-sized beds and a range of convenient and comforting amenities like a mini fridge, free Wi-Fi, coffeemaker, 42” HDTV and more. With space to do more than just sleep, the Standard Room includes a sitting area, activity table, chairs, and desk with an ergonomic office chair. Ideal for business travellers, the extra large Business Plus Room is outfitted with one king-sized bed and one queen-sized sofa bed. An oversized desk and ergonomic chair allow you to stay productive while 2 multi-line phones and free Wi-Fi help you stay connected to the office. When the workday is done, you can relax on the comfy sofa or plush easy chair and catch a movie on the 42” HDTV. All our standard amenities are included, plus a microwave. Pamper yourself in our lavish Whirlpool Suite, perfect for honeymoons, anniversaries, or anyone looking to unwind in style and comfort. Featuring a 2-person in-room whirlpool, a delightfully plush king-sized bed, a comfy queen-sized sofa bed and a range of premium amenities, this room is a gem among affordable downtown Calgary accommodations. Our deluxe Executive Suite offers the ultimate way to relax in spacious, luxurious surroundings. With a 2-person in-room whirlpool, one king-sized bed and one queen-sized sofa bed, this suite offers the privacy of a separate bedroom and the appointments of luxury-class lodging. Relax and enjoy no-charge Wi-Fi, two 42” high-definition TVs, fully adjustable climate controls, multi-line phones, microwave and more. For disabled guests, our Accessible Room offers all the comforts of home with a plush queen-sized bed and a range of accessibility features like wider doors and a large bathroom with elevated counter and support bars. All our standard amenities are included and, should a caregiver accompany you, the Accessible Room adjoins to a Standard Room to accommodate them.